Remember your days growing up? When video games were not the center of your universe? When you played outside until the streetlights came on and spent rainy days playing Monopoly and doing puzzles? Those were the good old days, but they don’t have to be gone forever. Board games are fun and are even scientifically proven to be educational and helpful for kids of all ages. To help the students with their memory skills, fine-motor skills, and listening skills, Fenney uses Bingo. “They work on finding the match and putting the chips on the matching picture, and have to remember to call out ‘Bingo’ when they achieve the goal,” she explains. Listed below are some other fun games that can help your child learn to strategize, problem solve, and improve his or her vocabulary in no time. Learning how to strategize is very important for children. Whether your child is just beginning to read and write or is working on a group project in high school, strategizing skills play a huge role in their development and productivity. Ticket to Ride. Upon first glance, this game looks complicated; but the directions are clear, and in less than 15 minutes, everyone from young children (as young as age six) to grandparents can be ready to play. (Partnering younger children with adults is a good way to help children learn the game and keep them interested.) By collecting cards to form specific routes that crisscross the United States, players aim to build the longest continuous route. The game is available in several versions, including one for younger children or those interested in learning more about specific regions of the world, such as Europe and Asia. Blokus. Colors and shapes make up this four-person game where the rules are very simple. The only requirement is that your shapes must connect diagonally. The paths to winning are endless: some players choose to branch out quickly, while others choose to block their competitor, and conservative players may spend lots of time in their respective corners. Blokus keeps children thinking a few steps ahead, and they often don’t even realize how much they’re learning as they play. Dominoes. The classic game for learning numbers has so many varieties that no one ever gets bored. Playing dominoes is a great way for younger children to learn matching, colors, and numbers. We like the double 12 set of dominoes, but the game easily can be simplified down to double nines or even double sixes. With relatively short rounds, the attention span of younger children can be maintained, and breaks are very doable. Variety keeps them interested, and they’ll love that everyone can play. Gravity maze. Using marbles and blocks that form a maze, this game requires some problem solving and creativity. Each card shows the beginning and the end, and provides the player with the tools he or she should use to create the maze. Then the trial-and-error begins. Even as an adult, I find some of the patterns challenging to create. As a one-player game, it’s fun to watch others and take turns trying to solve each pattern. ColorKu. When my son was about four, I was very much into solving Sudoku puzzles. I was so into them that he wanted to learn, too. Thanks to Pinterest, I was able to find a way to teach him using four colors and a simplified version of the game. A few years later, we discovered ColorKu, which is a beautifully crafted wooden game that uses nine colors instead of numbers and allows children to have a hands-on approach to these puzzles. We love to solve puzzles together, and when we run out of the provided puzzles, we can easily convert any Sudoku to a ColorKu. Quadrillion. Quadrillion is one of my favorite “quiet-time activities” for my kids. They can play this game individually, and it has no loud clanking pieces. It’s also really easy to clean up, which is great for Solo Moms! Using 12 pieces of various colors and shapes and four double-sided game boards, players have to finagle the pieces to fit so that all the open holes are covered. Each card dictates the setup and then the player has to figure out the placement of the leftover pieces. The game comes with 80 challenges, and the game boards are magnetic, so this could even work in the car or on an airplane. Spelling, vocabulary, and reading are key to learning. And the love for words can start quite young. As children grow, they like to show off their vocabulary, and playing word games is a great way to practice spelling. A few of our favorite family games are based around words. Bananagrams. This competitive, family-friendly word game is a favorite among all ages. From the youngest to the oldest players, everyone is able to enjoy building, rebuilding, and rearranging letters to form some great word groups. The game was designed to be appropriate for all ages and levels. According to the website, three generations of the Nathanson family were involved in the creation of Bananagrams. “We wanted a game that was competitive, but that the family could play together—ALL ages at the same time,” they say. Scrabble. A time-honored tradition, Scrabble is great for all ages. 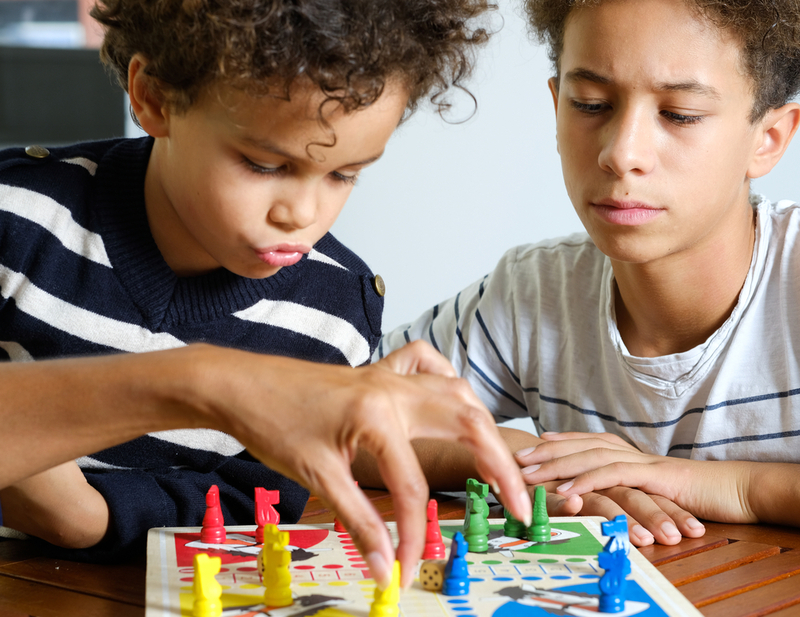 While younger children may have a harder time with the game, variations such as Scrabble Junior help them learn and prepare for the big leagues. Teens and adults alike love the challenge of building words, finding two-letter words that start with Q, and scoring big points. Growing up, I loved learning new words simply so I could use them in games later on. Ready to try some of these games with your kids? Consider adding one to your holiday purchase list or asking grandparents to give one as a gift. Games make for great family time, without extra money or effort. What educational games are your favorites?